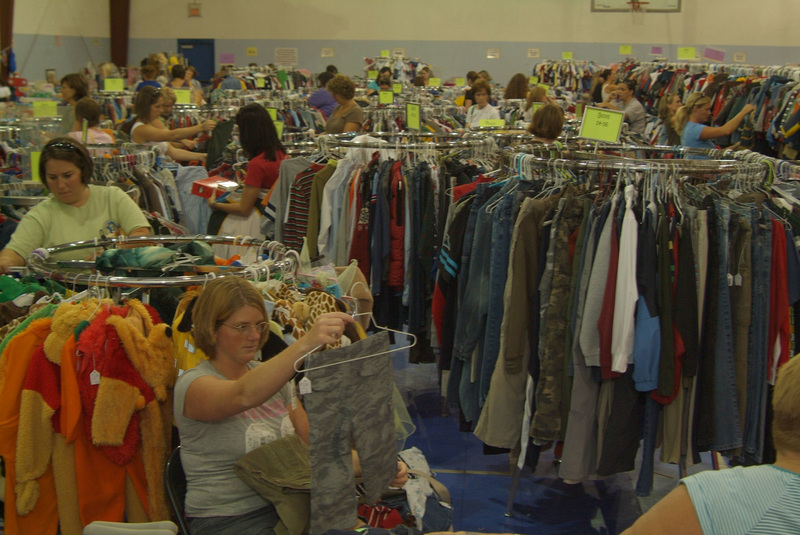 Volunteers (age 15 and up) are what make our sale so wonderful for all of our shoppers and consignors. Giving a little bit of your time before, during or after the sale, will earn you some great rewards! Volunteers get to shop FIRST at the Volunteer Preview Sale! This very special privilege is well deserved. 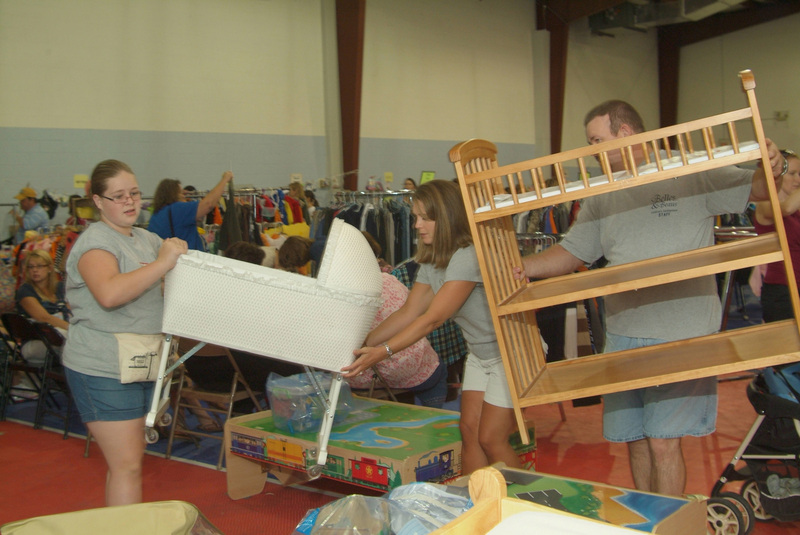 You do not need to consign with us to be able to volunteer! Thank you for all that you do! There are 3 different entry times for volunteers on Presale Night. This is determined by how much you volunteer. The more you volunteer the earlier you get to shop. Sign up for shifts via link below. 1 shift = a 7 p.m. pass. 2 shifts = a 6 p.m. pass. 3 shifts = a 5 p.m. pass. Newspaper,TV or Radio Coverage: Do you know someone "in the business" who can help spread the word? Help us publicize the sale in this special way and you will receive 2, 4 p.m. presale party passes. Email us here with your contact and what they are willing to do for us. Snacks/drinks/supplies: IF YOU SIGN UP FOR ONE OF THESE YOU MUST BE ABLE TO DROP THE ITEM OFF ON SUNDAY March 17TH BY 4:00PM. Please click here for a list of items that we need. Each choice is worth 1, 7 p.m. volunteer presale pass. You can sign up for a max of 2 slots. Pass(es) can be picked up when item(s) is dropped off. Meals: Meals must be COMPLETE and serve 8 adults. (8 tacos are NOT a complete meal). No spicy food please. You will earn 2, 6 p.m. volunteer presale passes. Passes can be picked up when meal is dropped off. If your are scheduled to drop off your meal after the pre-sale, you can pick up your pass any time before Wednesday. Click here for a list of meals and times. YOU MUST DROP OFF YOUR MEAL AT YOUR APPOINTED TIME (NO MORE THAN 30 MINUTES PRIOR)! NO EXCEPTIONS!!! Working the sale: Each sale shift that you work will provide you with 1, 7 p.m. presale pass. You can combine passes to get in earlier (ex: 2-6pm passes can be combined for 1-5pm pass, etc.) Click Worker Registration here for a list of times available to volunteer (Worker volunteer times now available). Please make childcare arrangements as children may not accompany you during your shift at the sale. This is for their safety. Passes can be picked up after your shifts are completed OR if your shifts are after the pre-sale you can pick them up anytime before Wednesday. Do not schedule your appointment during your volunteer time. Work 1 sale shift (3 to 4 hours)- Get an entry ticket for 7 p.m.
Work 2 sale shifts (6 to 7 hours) - Get an entry ticket for 6 p.m.
Work 3 sale shifts (9 or more hours) - Get an entry ticket for 5 p.m. In an effort to ensure the quality of the sale by retaining a sufficient number of volunteer workers, Belles and Beaus will require that workers fulfill their pledged obligation to work their assigned shift or successfully complete their duty given prior to the sale. In the event a worker does not fulfill their obligation or find a suitable replacement on their behalf, the worker will not be allowed to participate as a volunteer worker again or participate in any future Volunteer Preview Parties. Some extenuating circumstances will be considered but you MUST notify us promptly. Please understand that these guidelines have been created in an effort to maintain a high quality sale. Workers must be on time and fulfill their entire shift in order to reap the benefits of the Volunteer Preview Party. Thank you for your help. You are what makes our sale so great! We really appreciate your willingness to help and must be fair and consistent with all of our workers. Thank you for giving so much to us! Please contact us by email if you have any problems signing up for one of the above volunteer opportunities.